Leaders who take sustainability seriously understand its complexity. Sustainability is now part of mainstream business conversation and companies try to approach sustainability in a strategic manner. Precisely, because sustainability is NOT a particular area of expertise. Nor is it a matter of communication – not even the most skillful communication can possibly ensure long-term profitability of the business. The world has simply become too complex to be handled as a technical challenge. Whether we like it or not, we need to upgrade our worldviews and skills for handling complexity. Individuals, culture, systems, experience and behaviors - all this needs attention. One that manages to integrate them into a holistic worldview can probably succeed with embedded sustainability - the integration of sustainability philosophy of the company's core business. Inspired by the latest research in leadership and equipped with effective tools, we work to help our leaders deal with greater complexity, creating credible visions and lead in uncertainty. Mindset is the "software", our interior patterns of mind, or frames of reference, from which we see the world. Our "mind settings" ultimately determine how we act. That is why we can have different definitions of sustainability - and thus different views on its significance, meaning and scope. We can treat it as an instrument that can improve the mission critical functions – if it is our dominant view we prioritize lean production, efficient use of resources thus reducing costs. Sustainability is definitely an environmental issue as well - then we may offset our carbon emissions by planting trees in Africa. We see sustainability as a personnel matter – then we devise sensible personnel policies, modern compensaton packages and work with employer branding. We see sustainability work as a risk-management issue - and focus our attention on standardization and also good communication. 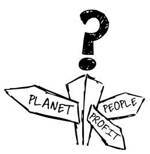 Which stakeholders will be involved also depends on how we look at the company's place in a larger context. All of these perspectives are important. The trick is to integrate them in a way that creates value for ALL at the expense of no one. The equation is not impossible – but it solving it requires thinking beyond traditional business models and standards. The latest research on leadership and sustainability demonstrates a clear correlation between the leader's mindset and the degree of success of strategic sustainability initiatives. It is the leader's own mindset and its potential for transformation, that becomes a crucial factor in the organization's potential for gearing up its sustainability work. Sustainability is as much about the mindset through which the world is seen as it is about the activities taken in support of it. How do you know if your leadership capacity is sufficient to deal with the challenges you face? What leadership competencies do you need to develop in order to come to your next level? With the base in on your personal Leadership Development profile, an authorized LDF consultant guides you to greater awareness of your action patterns and how they influence your effectiveness as a leader. Where do you place your attention and what parts of the context remains unnoticed by you? What consequences does it have for you and the others? How could you become more inclusive? How do you tend to create visions and communicate them? Who remains unattended? How can you notice hidden communication needs and tailor-make messages to include all? Who do you tend to involve and whom you leave behind when you make decision? What kind of decisions work best and worst with you? How do you tend to deal with complexity and ambiguity? How can you learn to lower your anxiety and remain productive, creative and inspiring for others in stormy waters? How you tend to motivate and be motivated? Why do your motivation patterns work better on some persons and worse on others? How can you learn to read what people want? These and other aspects of your leadership get uncovered and a path for your vertical development is designed – to include the present capabilities and transcend to a next-level leadership capacity available to you. When our organization is facing a complex challenge, it is particularly important to understand the leadership capacity that is available to us. A broader mindset can produce and deal with a more detailed picture of reality. It can easier integrate multiple perspectives in a holistic vision that is sustainable for ALL in every situation. Such a mind is the foundation of sustainable leadership.